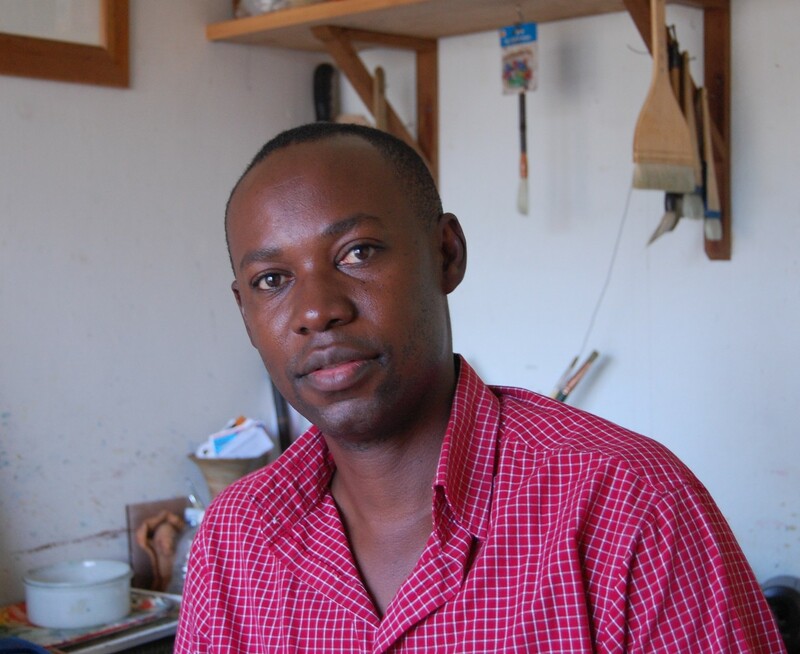 Artists like Taga Nuwagaba are endowed with a wealth of technology previously unavailable to master painters, in the form of cameras and optical instruments, yet a great deal of precision and technical mastery is still required to create any art worthy of their skills. The Me and My Totem exhibition at the Uganda Museum was a collection of Nuwagaba’s paintings depicting the totems of the Baganda people. A totem is an object such as an animal or plant which serves as the symbol of an ethnic group or clan. It is revered by its clan members and cannot be eaten. Painting the totems of each of the 52 Baganda clans was a project that took the artist over three years. The works in this exhibition were so accurately painted that they resembled photos. In trying to get a feel for technique, some people were examining pieces as if they had appeared by some fortunate magic. I saw a young man in a dark shirt at the exhibition studying one of the works. What was in front of him seemed unbelievable in its photographic realism. After peering intently at the portrait of a lion, he glanced around furtively and did what others only dare imagine. He rubbed the nail of his index finger on the corner of the painting and inspected it. However this was not a marvel of photoshop or laser printing. Nuwagaba was born in Mbarara in 1968. Effectively his career began in 1979. While at school, the students were denied some art materials that remained locked up in storage. Ironically, the political events of the era later turned the school into a barracks during the 1979 war. He has been painting since then. Before that it was not uncommon for him to use flowers and leaves, ash and powdered charcoal which were difficult to work with. They didn’t hold fast to the work surface. After completing his studies at Makerere University, he worked as an artist on Bayswater Road before returning to Uganda in 1993. Two years later he was teaching art at the Christian Brother’s University in Memphis Tennessee as a Fulbright Scholar. Louis K. Meisel used the term Photorealism in 1969 to describe the use of photographs as source materials and aids to painting. Based on photographs taken during trips to the wilderness, Nuwagaba’s paintings are highly resolved with a full range of tones. Every stroke of fur, bristle and horn are rendered realistically. There are sharp details such as the shine of a damp snout in sunlight, the grooves in a horn and the characteristic variations in body colouring. Taga Nuwagaba has been hailed as a gifted artist and as a conservationist, he is known for his paintings of gorillas. Previously, he has dabbled in abstract art as well as portraiture and nature. His works are sharp and alive with a very sophisticated photo-realistic technique. He pays a high level of attention to every detail from the colouring to the posture and even the setting of the subject. Throngs of people milled through the three exhibition halls. It was apparent that by giving the right cultural signals, it was possible to attract people from diverse backgrounds. Various people appreciate different things from the stock choices available e.g music, folk dances and drama. Omulangira David Wasajja, brother to Kabaka Ronald Muwenda Mutebi was the guest of honour, and rightly so since the exhibition focussed greatly on Buganda Totems and left the bearers of the same brimming with hope for a glorious future. Unfortunately a certain kind of decline gradually creeps on the Museum, from steps worn smooth, to plaster that chip off to the rhythm of peeling paint. As for the artefacts themselves, there are subtle signs of deterioration not to mention secret wildlife that crawls in the dark corners between them. But for this particular exhibition, the display cases were concealed in crisp swaths of soft-white fabric on which the frames of the paintings were mounted. The water colours were delicate and subtle, with a light and vibrant quality. Washes and glazes of various degrees harmonised to create images, while white paper provided the requisite bright surface for working. Omutima Gw’ensi is a forest floor fungus. In Nuwagaba’s rendering of this totem, a series of green washes provide a balanced background, giving a textured result as well as a striking sense of atmosphere. 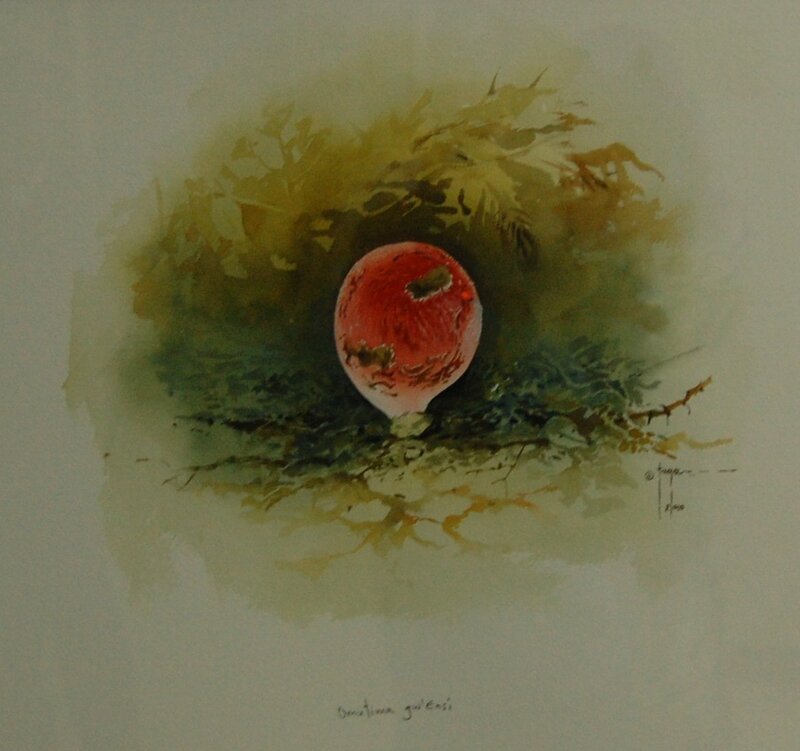 Alizarin crimson highlighted the fruiting body, softened with white and textured with burnt umber. The greens have been modulated with raw umber and blues, giving the painting a richer feel.